A number of satellites currently in orbit, including the European Space Agency’s CryoSat satellite (which was designed specifically to monitor land and sea ice at the poles), have been producing better quality data on the planet’s ice sheets in Antarctica and Greenland. 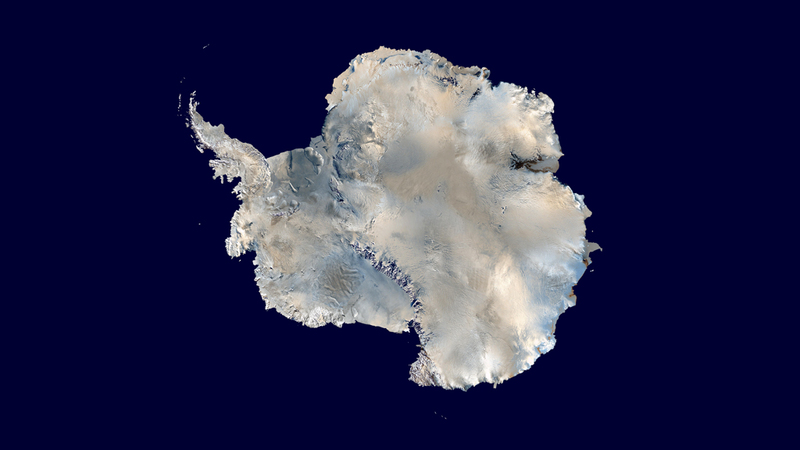 A study released in May 2014 describes how new data collected by CryoSat since its launch in 2010 has led to a doubling of the estimate of ice loss from the Antarctic Ice Sheet. In addition, two other new studies predict that the current rapid rate of ice loss from West Antarctica will not slow down over the next century. Andrew Shepherd, Professor of Earth Observation at the University of Leeds who is Principal Scientific Advisor to ESA’s CryoSat mission, explains how information from new generations of satellites, including CryoSat, has helped improve our understanding of ice mass balance on the planet’s ice sheets. He also helps put the new recent studies on ice loss from Antarctica into perspective. CryoSat data shows that the Antarctic Ice Sheet has been losing, on average, 159 billion tons of ice every year for the past three years (once CryoSat passed its commissioning phase). This is twice previous estimates of ice loss from the Antarctic Ice Sheet that were made during the last decade. Is this upward revision due to accelerating ice loss, or is it more due to better earth observation techniques? In the past, we had satellites with altimeters (devices that bounce a signal from space to the Earth’s surface to measure parameters like altitude) specifically designed to observe the planet’s oceans. They did a very good job of that, but they didn’t fly north or south of 81° at either pole. And in Antarctica, that’s a big problem because it means the satellites couldn’t observe large parts of the ice sheet. In the Northern Hemisphere, it’s also a big problem because it affects our ability to look at Arctic sea ice and the northernmost part of the Greenland Ice Sheet. The older satellite missions were also only designed to look at flat parts of the planet, like the oceans, so they did not perform particularly well at the steep edges of the ice sheets in Antarctica and Greenland. We know from a wide range of satellite measurements, that most of the changes to the polar ice sheets are happening at their edges, where they come in contact with the ocean. Our inability to look at these locations in the past meant that we were missing a lot of the important changes that were going on. When we used only the previous class of altimeters, we estimated that Antarctica was losing about 80 billion tons of ice each year. But with CryoSat, we can now look at almost all of the ice sheet, because it follows an orbit that takes it to within a few kilometers of the poles. The satellite is also designed to be able to look at the edges of the ice sheets in greater detail, with a much smaller need for ground truthing. And so with a greater ability to monitor changes in the ice sheets, we’ve been able to see that ice loss from Antarctica has been about 159 billion tons a year over the past few years, or twice the previous ice loss estimate of about 80 billion tons a year. We’re pretty sure that some of the revised estimate of ice loss is due to better technology allowing us to detect ice losses in places that just weren’t seen before. But we also know that in West Antarctica in particular, the rate of ice thinning has continued to rise. So in summary, it’s a combination of both better satellite measurements and an increase in the rate of ice loss that has led to an increased estimate of ice loss from the Antarctic Ice Sheet. A few recent studies have concluded that ice loss from the West Antarctic Ice Sheet has passed a “point of no return” - meaning that ice loss from this part of Antarctica is not expected to slow down over the coming century. Is this a reasonable projection to make based on the current ice sheet models and observations? There were a couple of papers released recently looking into this. One was by Eric Rignot’s research group at the University of California Irvine, and one by Ian Joughin’s research group at the University of Washington. The first paper looks at the rate at which glaciers in West Antarctica are losing ice and retreating inland, and also what lies ahead if the retreat were to continue. From the pattern of retreat and the geometry of the glaciers further inland, Rignot and his team inferred that the retreat appears to be unstoppable. We published a study in 2012 based on the same satellite observations Rignot’s team analysed, and we reached a similar conclusion; although some scientists had thoerised that the rate of ice retreat at the Pine Island Glacier would diminish, the satellite observations we used contradicted that. It seems that the rate of ocean melting at the glacier terminus, which we believe is responsible for the retreat of the glaciers in West Antarctica, is sufficiently strong enough to maintain the pace of retreat. It’s important to recognsie that Rignot’s studies as well as ours report only observations, and extrapolating recent trends is not the best way to make predictions about the future. The planet can, for example, get warmer or cooler for different reasons over short period of time - and for reasons that are not necessarily related to long-term climate change. So recent changes may not be a good analogy for changes in the future. The second paper, Joughin’s study, used a ice sheet model to simulate how West Antarctica might evolve over the next century, given expected long-term trajectories for regional and global climatic change. His study, which represents our best understanding of how ice sheets behave and how they interact with the climate system, concluded that ice retreat in West Antarctica would continue unabated over the next century. Putting all of these studies together, there is now little doubt that there has been progressive retreat of ice over the past 30 years in West Antarctica, and that the rate at which ice is being lost has been increasing (we see this in the CryoSat data as well). Looking at the long-term picture, numerical simulations - which are the best tools we have for predicting future ice losses - suggest that the ice retreat isn’t going to diminish in the coming decades. So ice loss in West Antarctica is being driven primarily by a warming ocean, and not by increasing atmospheric temperatures in Antarctica? Ice loss from the West Antarctic Ice Sheet has nothing to do with rising atmospheric temperatures. Antarctica is really cold; the average air temperature is between 30°C and 40°C below freezing in this part of Antarctica, and it would need to rise by an astonishing amount before it could effect any kind of change to the ice sheet. However, sea water can and does deliver a lot more heat to the ice, and the retreat of glaciers in West Antarctica over the past couple of decades are consistent with a modest, 0.5°C rise in ocean temperature, and there is now good evidence in the ocean record that this has occurred. What’s still not clear, however, is what has caused the ocean in Pine Island Bay to warm and thus deliver more heat to this part of the West Antarctic Ice Sheet. While a 0.5°C rise in ocean temperature is of course in line with the rise in average ocean temperature over the past century, it’s also possible that what we’re seeing is the result of a warm current migrating into the embayment. What role does the Antarctic Circumpolar Current (ACC) play in these changes, if at all? The ACC is a very deep current of relatively warm water following the sea bed around Antarctica, a few kilometers below the surface and usually a few hundred kilometres offshore. At up to 4°C in places, the heat of the the ACC would certainly be sufficient to cause rapid melting of the ice sheet if its water managed to make its way to the edge of the ice sheet. Has the Anatarctic Circumpolar Current been becoming warmer? I am not an expert in oceanography, and there is still a lot of progress to make in this field because the oceans are vast and difficult to survey. What we know is that the West Antarctic Ice Sheet is melting at its base where it has come into contact with warm ocean water. But we know also that this warm water is about 1 km below sea level and that, according to general circulation models, is unlikely to have come into contact with Earth’s atmosphere for centuries. So we’re left with a dilemma when it comes to explaining how Pine Island Bay has gotten to be warmer: Is there is a deficiency in our ability to model deep ocean circulation, or is it simply the migration of an ocean current that is not directly related to global climate change? Where does the current ice loss from the Antarctic Ice Sheet fit into what we know about its past behaviour during previous interglacial periods through paleoclimate data and modelling? Will the West Antarctic Ice Sheet eventually reach a new equilibrium? What we are able to tell from analysis of the geological record is that the rate at which the part of West Antarctica around the Amundsen Sea is currently losing ice ten times more rapidly, if not more, as the ice retreat that occurred during the last interglacial period (the Eemian, 130,000 to 114,00 years ago). So the ice retreat we’re currently seeing is much more rapid than we’d expect to see during typical interglacial cycles. But if you go back further in time, research indicates that in previous interglacials, the West Antarctic Ice Sheet collapsed over period as short as a few centuries. That would have added up to five metres of sea level rise to the world’s oceans in a relatively short period. Such rapid sea level rise – at rates upwards of 50 centimetre per century - would be difficult for society to deal with, and would effectively double what we expect according to IPCC projections. However, the numerical model that Ian Joughin developed in his latest study does not suggest that West Antarctica will lose ice this rapidly; instead he predicts lower losses equivalent to less than one millimetre sea level rise each year. So on the basis of our current understanding of how ice sheets respond to climate forcing, we don’t anticipate extreme sea level rise over the next century. It should be appreciated that the models we use to make future predictions are really only as good as the data we provide to them. For example, the roughness of the bedrock beneath ice sheets has an important effect on how fast ice flows. In another recent study published earlier this year, Rignot’s team showed that the bedrock beneath the Greenland ice sheet is in places far smoother than had been deduced from sparse airborne surveys. If the same were true for Antarctica, its glaciers may respond more rapidly to climate forcing than our current models predict. So we have to continue to assess how well the models are doing against observations, and that’s why having dedicated missions like CryoSat looking at the ice sheets is so important. Will this series of recently published studies looking at the changes taking place in the ice sheets force a re-examination of sea level rise predictions made by projects like Ice2sea and the IPCC’s 5th Assessment Report? Or are the new studies in line with what the research has been saying over the past five to ten years? I think collectively the four recent papers released in May 2014 are likely to lead to an upwards revision of sea level rise projections. The observational studies - for example the one our team reported based on CryoSat data - show that we’ve missed signals of thinning that couldn’t be seen before, which means the ice sheets are causing more sea level rise than was previously estimated. The numerical modelling studies show that we’ve improved our ability to simulate how West Antarctica will respond to expected changes in climate. This, in turn, demonstrates that we need to improve the models that are used to make climate projections by incorporating the very latest developments into ice sheet modelling. And of course, observational studies continue to remind us that even the very latest ice sheet modelling efforts can be improved of we improve the data on which they depend. Your study was able to determine how much ice is being lost form the different parts of Antarctica (East Antarctica, West Antarctica, and the Antarctic Peninsula). Why is there such a difference between the different parts of the ice sheet? The vast majority of ice loss from the Antarctic Ice Sheet is happening in West Antarctica. However, the Antarctica Peninsula is responsible for about 20% of the overall ice loss, even though it covers only 5% of the continent, given its northerly setting which exposes it to a warmer climate. Long-term climate records indicate that the Antarctic Peninsula has warmed on average about 2.8°C over the past half century, and this warming is believed to be responsible for increased ice melting. 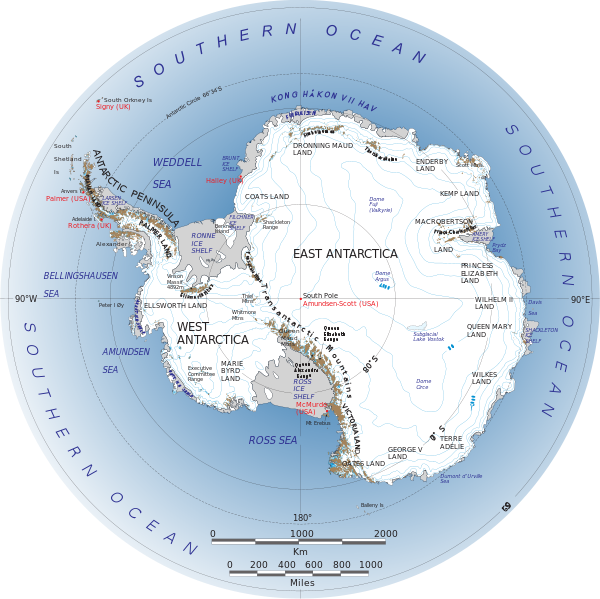 East Antarctica, on the other hand, is relatively stable. In some years it grows thanks to increased snowfall on its surface, and at other times it stays at about the same size. It just so happens that the last four years we observed it using CryoSat, the East Antarctic Ice Sheet didn’t gain or lose much ice. Given that there are parts of East Antarctica where the bedrock of the continent and therefore the bottom of the East Antarctic Ice Sheet is well below sea level, there have been hypotheses that if the ocean were ever to encroach beneath the ice sheet, it could contribute to a significant and rapid loss of ice from the ice sheet. Would this kind of scenario be feasible in the near future (next few hundred years)? To the best of our knowledge, there are two parts of the East Antarctic Ice Sheet which display signals of dynamic imbalance, meaning the ice is flowing out towards the sea faster than it can be replenished by new snowfall on top of the ice sheet. Looking at CryoSat observations, ice loss from one of the regions in question, the Cook Glacier, seems to have abated. However, the Totten Glacier has continued to thin, and this remains the only part we know of in East Antarctica where we’re concerned that the thinning of the ice reflects some kind of dynamic instability. It’s true that the ice sheet basin in that part of Antarctica is well below sea level, and in principle could follow a similar trajectory of retreat to West Antarctica. But we don’t see anything like the massive spreading of ice thinning inland like we currently see in West Antarctica. In East Antarctica, we only see thinning spreading a few tens of kilometres inland. But in West Antarctica, over the past few decades, thinning has spread up to 500 km inland. So the dynamic between the two parts of the Antarctic Ice Sheet is very different. Before you talked a bit about advances that have been made in satellite observation over the past few years. Do you and your colleagues working in this field have a wish list of things you’d like to have or see happen? Over the past 20 years scientists have deployed some very powerful sensors on satellites to examine the polar ice sheets (or at least parts of them). We have used synthetic aperture radars (SAR) to map the changes in ice flow; we have used radar and laser altimeters to map change in ice elevation, and we have used gravimeters (like on NASA’s GRACE satellite) to measure changes in the weight of the ice sheets. These tools have given us three different pictures of how the ice sheets behave. Right now, though, there are few satellite missions designed specifically to monitor the polar ice sheets. CryoSat is really the only mission in this regard and it has already exceeded its original lifetime. It was designed and commissioned as an exploratory mission, providing an opportunity to demonstrate the capability to operate a novel type of sensor (an interferometric synthetic aperture radar altimeter) in a novel orbit (88° relative to the Equator) allowing it to survey the Polar Regions. Now that CryoSat has shown this is possible, our challenge is to persuade the space agencies to commute the successes we’ve had into an operational mission that will continue to monitor the Polar Regions. And that’s something that we’ll be working on in the coming years. How long is CryoSat expected to last? CryoSat had a nominal mission life span of three years, and the industrial partners that provided the key components of the satellite guaranteed the satellite for seven years. But after seven years, it will have exceeded its full expected mission lifetime. It could last for a lot longer, and we’d be happy if it did, but it doesn’t need to in order to satisfy its initial mission and build specifications. The satellite still has fuel that will help it to manoeuvre for quite some time. It was launched with about 35 kg of fuel, and it’s still got 34 kg of that fuel after four years. But satellites don’t tend to fail from lack of fuel. They tend to fail from breakages. So when the CryoSat mission eventually ends it will most likely catch us by surprise. Do you have a wish list for the kind of satellite missions you’d like to see? If I had a wish list, I would deploy a satellite carrying both a laser and a radar altimeter. Although they sound similar, each of these instruments measures ice in a different way. The laser examines the true surface of the ice sheet, while the radar can detect changes a little bit below the ice surface (down into the semi-compacted snow, or firn). The difference between these two heights can tell us how much snow is falling on the ice over a given time which, in turn, helps us to reduce uncertainties in calculating changes in land and sea ice mass. This would help us to distinguish weather anomalies from long-term climate trends, which are our main concerns related to sea level rise. Andrew Shepherd uses satellites to study physical processes of Earth's climate. He is a member of the National Centre for Earth Observation (NERC), coordinator of the European Space Agency VECTRA InSAR consortium, and a contributing author of the Fourth Assessment Report of the Intergovernmental Panel on Climate Change. 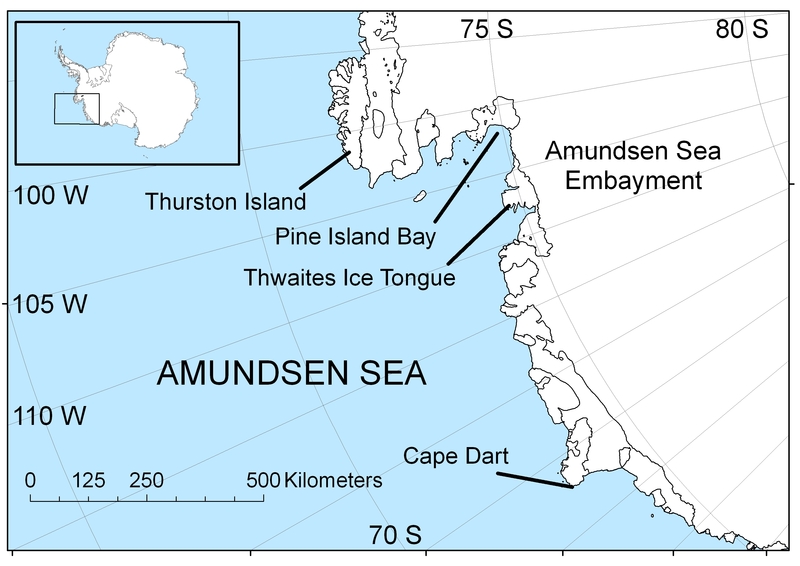 The part of the West Antarctica Ice Sheet that touches the Amundsen Sea has been losing ice very rapidly in recent years due to the incursion of a warm water ocean current into the region.